(Nanowerk News) The direct conversion of a temperature difference into electricity, known as the thermoelectric effect, is an environmentally friendly approach to directly harvesting electricity from heat. The ability of a material to convert heat to electricity is measured by its thermoelectric figure of merit. Materials with a high thermoelectric figure of merit are thus widely desired for use in energy harvesting. Quantum confinement effects in nanomaterials arising from their discrete electronic states may increase their thermoelectric figure of merit. 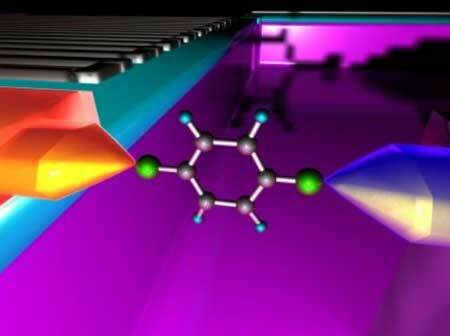 In particular, a single molecule bridging two electrodes displays quantum confinement. Optimization of the electronic states of a single molecule bridging electrodes could yield a large thermoelectric effect. The contact between the molecule and electrodes will also influence its thermoelectric behavior. However, this relationship has seldom been considered because of technical difficulties. Researchers at Osaka University have recently investigated the influence that the geometry of single molecule–electrode contacts has on the thermoelectric behavior of the molecule. As reported in a recent edition of Scientific Reports ("Roles of vacuum tunnelling and contact mechanics in single molecule thermopower"), they simultaneously measured the electrical conductance and thermovoltage of molecules with different groups anchoring the molecules to the electrodes at room temperature in vacuum. The multiple thermovoltage states of the molecules were investigated by thermoelectric measurements and theoretical analysis. The largest thermoelectric effect was observed for structures containing a stretched thiol linkage with the gold electrode. The increased thermovoltage of the structures with a stretched gold–thiol bond was attributed to this configuration shifting the energy level of the molecule involved in electron transport to a more favorable position. “The observed dependence of thermovoltage on the anchoring group in the junction structures reveals a way to modulate the thermoelectric performance of single-molecule devices,” explains Tsutsui. The group’s results expand our understanding of how the geometry of a single-molecule device can influence its thermoelectric figure of merit. These findings should contribute to the development of single-molecule thermoelectric devices that can efficiently derive electricity from heat.